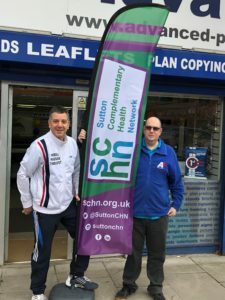 SCHN Will Be At The Marsden March, this Sunday 10th March, 2019 For The Second Year Running Massaging The Walkers At The End in Sutton. Sutton Complementary Health Network’s Vice Chair, Public Relations and Marketing Officer Theo Theodoris, (also of Mobile Sports Massage by Theo) would like to thank Gary Beckett of Advanced Print Services for their lovely New Sail Banner all ready for this Sunday’s The Royal Marsden – Sutton Marsden March. To all the 5,000+ walkers do look out for The SCHN Sail Banner at the finish line. For the second year running we will be providing free massages for all walkers. All Therapists of SCHN are volunteering their time for you. So make the most of us. See you all on Sunday.